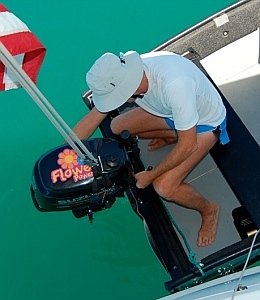 This page is a review of the 10′ Porta-bote operated with a 6 hp Suzuki 4-stroke outboard. 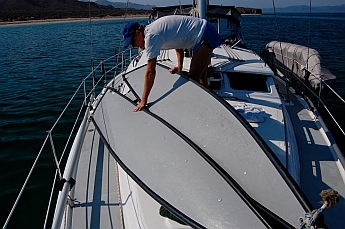 The Porta-bote’s overall design is terrific, and it worked very well for us as a cruising dinghy during our nearly 4 year cruise of Mexico’s Pacific coast aboard our Hunter 44DS sailboat named Groovy. 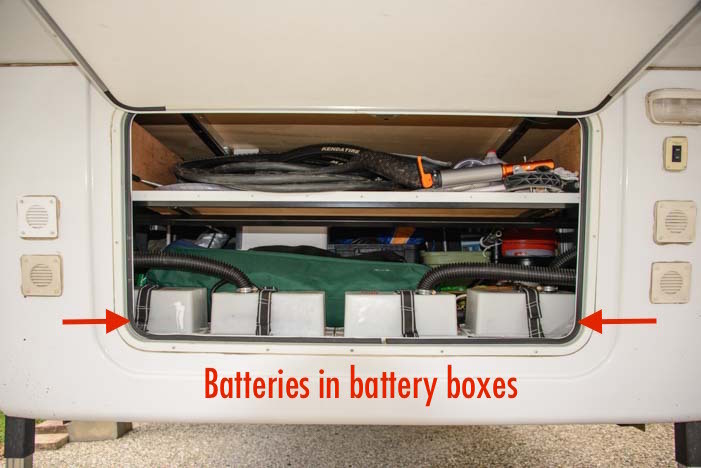 We initially posted this review in 2012 after we had owned and used the Porta-bote for a year. 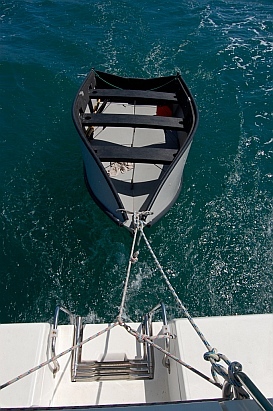 10′ Porta-bote with 6 hp outboard. Since that time, the Porta-bote design has been completely overhauled and revamped. The new Alpha series models being sold today are much improved over the older models. Many of the problems we had with our Porta-Bote have been eliminated by the new design. In the end, we used the Porta-bote as our cruising dinghy for nearly four years and we were very happy with it. This review has been updated to indicate the areas in which the new Alpha series Porta-botes outshine the older models like ours. We learned, after the fact, that the design engineers read and used this Porta-bote review to pinpoint aspects of the design that needed improvement when they did the Alpha redesign. I am really thrilled that our notes proved useful to them and gave them some good ideas. 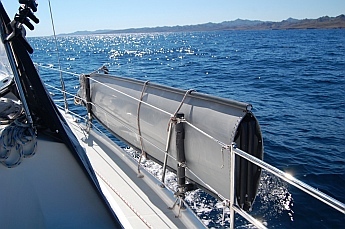 We made a wonderful system for carrying the Porta-bote along our lifelines while on passage, and we found that the Porta-bote fit perfectly into our sailboat’s swim step. We created a lightweight davit system to hoist it up out of the water every night. The Porta-bote was light enough, even with the engine mounted on the transom, that I (an able bodied woman) could hoist it by hand to put it on our swimstep for the night without needing to winch it. The notes below are offered for anyone considering using a Porta-bote as a cruising dinghy. It details how we used the boat and the custom modifications we made. Any criticisms we had of the boat that have been fixed in the new Alpha series are clearly noted in the review. Would we consider a Porta-bote for a future tropical cruise? Absolutely!! There’s enough room to take a snooze! 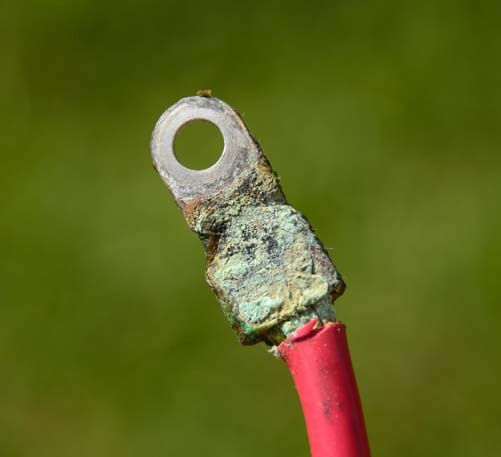 ** We did not know this at the time, but if you want a drain plug, Porta-bote recommends installing a Ronstan RF294 Drain Plug on the side of the boat just in front of the transom and above the black tube. 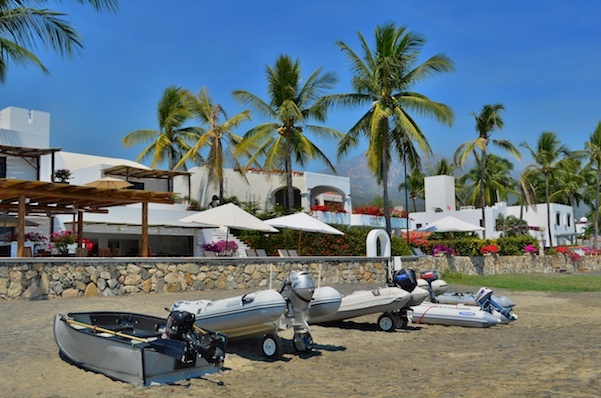 Our overall assessment after nearly four years of using the Porta-bote in anchorages from San Diego to Zihuatanejo, Mexico is that it is a great little cruising dinghy, especially once a few modifications have been made. Here are some details about its strengths and weaknesses along with descriptions of the upgrades we did to make it work better. 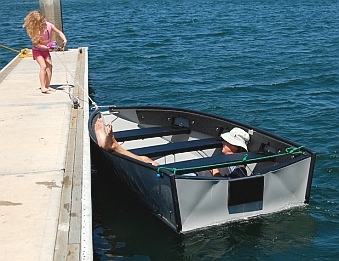 The Porta-bote is not as compact a boat as you might think because it is not just a folding hull. 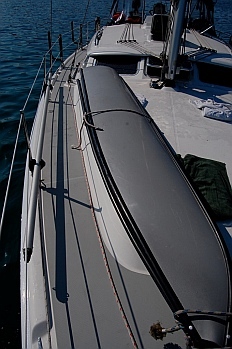 It is a hull, three large seats and a big transom Note: in the Alpha series the transom is not a separate component as it was in the older Porta-botes. All the pieces of the Porta-bote are big and awkward to carry. 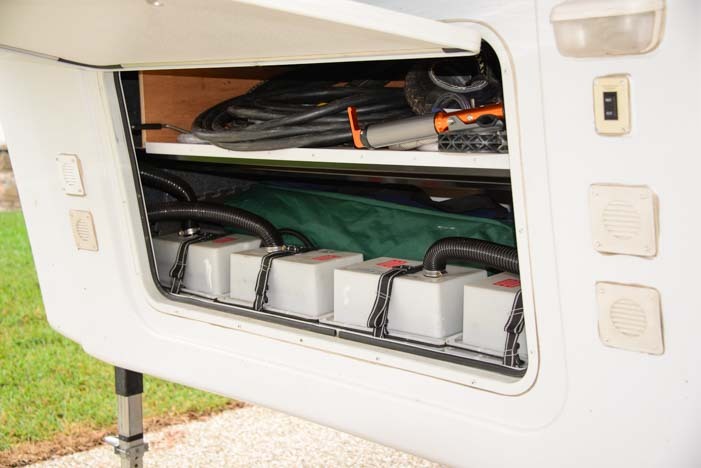 For longer passages we disassemble the Porta-bote and store the hull in kayak-style racks outboard of Groovy’s starboard deck, so it is tucked out of the way without having to hang in davits off the back or lie upside down on the foredeck as most cruising dinghies do. Because of their length, we store the longest seat and the transom in the master stateroom (ugh!). We store the other two seats in our big cockpit locker, standing on end for easy retrieval. 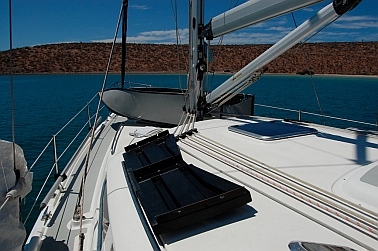 For overnights at anchor we lift the dinghy in retractable davits that are built into our solar panel support arch. The Porta-bote fits perfectly into our sugar-scoop transom, resting neatly on the swim platform and held in place by the shape of Groovy’s hull. We leave the outboard mounted on the Porta-bote. The boat and outboard are light enough that each of us can hoist the dinghy unassisted (our davit system has a simple 4-to-1 purchase and no winches). Splashing the boat in the morning is just a matter of lowering it a foot or so back into the water, which each of us can also do unassisted. The seats on the new Alpha series Porta-botes have been completely redesigned, and the transom is integral to the hull and not a separate component, so the following notes pertain strictly to older Porta-botes. The three seats and transom are all large, heavy components made of plastic and metal. Each one has some swinging legs that hang off of it, making each piece quite a challenge to carry on a pitching boat. Each of the three seats has two (or three) metal U-shaped rods attached underneath that flip out and become the seat legs once the seat is installed in the Porta-bote. These metal loops are only loosely attached to the seats, relying on spring tension to keep them in place. The first time I carried a seat forward on Groovy’s deck, one of the metal pieces detached itself from the seat and vanished over the side, never to be seen again. Fortunately Porta-bote replaced the piece free of charge. We now use duct tape to keep tension on the open part of the U-shaped rods so these crazy loops don’t fall off when we carry the seats to and from the foredeck. The metal loops fold back against the bottom of the seats. Actually, they swing freely and independently of each other, flopping all over the place. However, with some coordination they can be held against the seat while carrying it, still leaving a hand free “for the boat.” Unfortunately the loops don’t fold flat to the seat and there are no clips to hold them in place, so they flop around until you get a grip on them as you carry the seat. Also, when folded, at least one of the loops on each seat sticks out an inch or two beyond the end of the seat. So in the stored position the seat becomes even longer due to this metal bracket sticking out the end. The design of the seats and legs could be infinitely improved. The seats could be designed to fold in half, shortening them considerably for stowage. The legs could fold into the seats and clip into place so they don’t flop around. There is a myriad of possibilities for designing solid functional seats that are easy to carry and store. However, the current seats are very awkward, and the black plastic will singe your hand when you touch it after the boat has been sitting in the tropical sun for a few minutes. Simply making the seats of white plastic would be an immeasurable improvement. We use towels to cover the seats, or in very hot places rely on flotation cushions (which slide around under you). We have heard of cruisers making sunbrella seat covers for the seats too. In the hottest places a towel is not sufficient and you will still burn your backside while sitting on the seats. The biggest problem with the seats, besides being so difficult to lug around on a rolling boat, is that they are too big to stow easily. Some cruisers lash them on deck, but we have neither found a good place on deck for them nor come up with a quick way to tie them down securely. 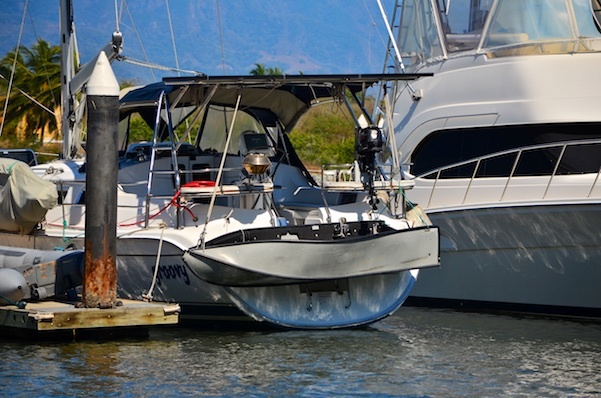 Many cruisers simply tow their Porta-bote instead of hassling with assembly and disassembly. The porta-bote is snug in its perch on the starboard side. 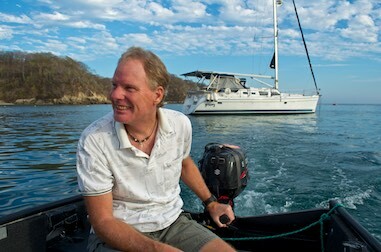 We met a couple that towed theirs thousands of miles up and down the Mexican coast. I consider this risky if the seas get out of hand, and it also seems to defeat the purpose of the folding “portable” nature of the boat. On our boat the transom and middle seat are too long to fit in a cockpit locker in a way that is easily accessible, so we store them alongside our bed. The other two seats fit in our large aft cockpit locker standing on end. In order to get a grip on these big floppy seats, we use several large Navy-issue canvas bags, storing two seats to a bag and putting a second bag over the other end so the whole seat is covered (they are salty and dirty when removed from the boat, and who wants that next to their bed?). 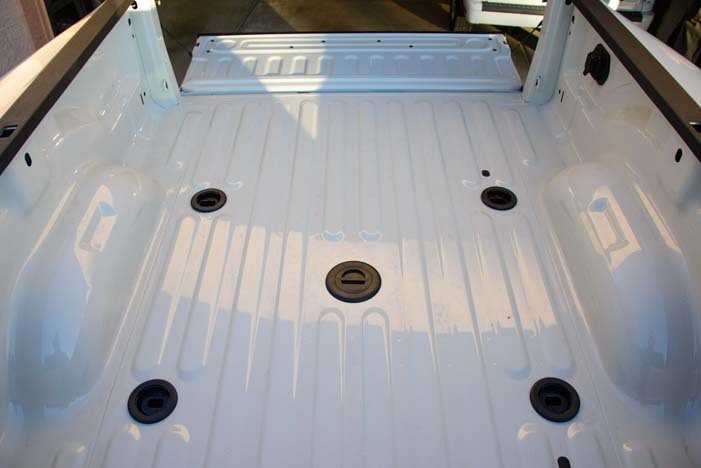 A tidier solution would be to have custom canvas bags made to fit the seats with a large rugged handle on the side. It would be awesome if these bags came with the Porta-bote right from the factory! 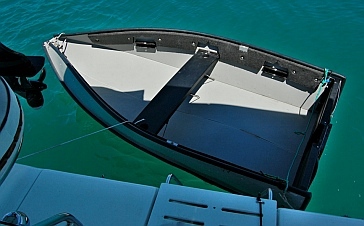 The transom is not only long, wide and heavy, it has a big flopping plastic piece that folds over the hull when the transom is installed in the Porta-bote to provide a support for the outboard to clamp onto. 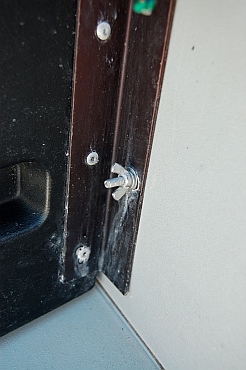 This heavy piece is held to the transom by a thin piece of plastic that acts as a hinge and looks very prone to tearing. 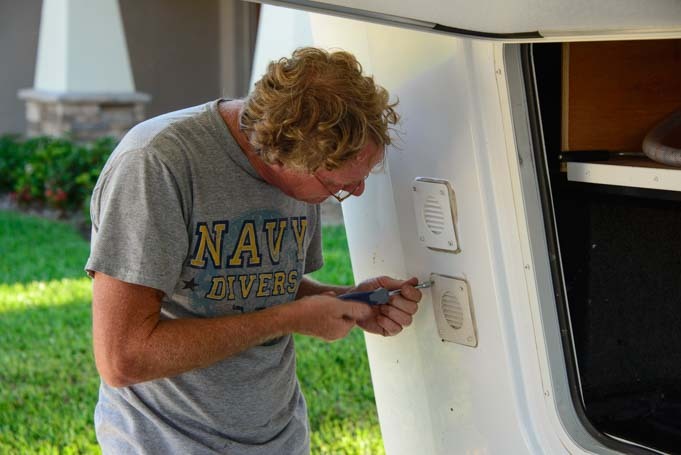 When we tow the Porta-bote, we remove the outboard, and then the plastic outboard support piece flaps as the Porta-bote goes over the waves, threatening to rip the hinge piece. To stop the flapping and wear and tear on that thin hinge, we use a large clamp to clamp the outboard support piece to the Porta-bote’s hull. The transom also has two long metal L-brackets along each side. These are the supports that hold the transom in place: two pairs of wing nuts and washers secure the metal L-bracket to the side of the hull. These L-brackets are major ankle-biters and interior cabin wood-gougers when carrying the transom around. 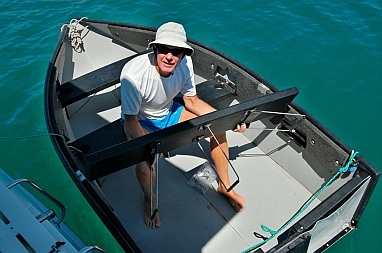 Therefore, we load the transom and the longest seat into a canvas bag before lugging them anywhere — the flopping legs on the seat are held in place, the flopping outboard engine mounting piece is held in place, and the sharp metal edges of the L-brackets are somewhat protected by the heavy canvas. Some clever engineers at Porta-bote could surely devise a way to secure the transom without requiring large metal L-brackets (or tiny wing nuts and washers, for that matter), and the outboard engine mount could definitely be designed to fold into the transom so it lies flush and is held in place with a clip system that keeps it from flopping around. 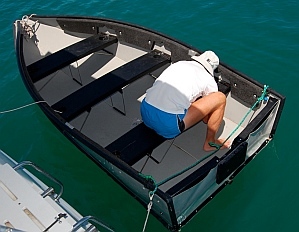 Please note that the new Alpha series Porta-botes have the transom integrated into the hull which eliminates the problems associated with carrying the transom around and attaching it to the hull! We have tried several methods of assembling the Porta-bote on Groovy’s deck, and the best system we have found is described below. It takes us about 15 minutes, including retrieving the many parts from the cabin and the cockpit locker. When the hull is in its stowed position, it is folded lengthwise twice: first the sides fold into the middle, then the (new) sides are folded in towards each other. 1. Carry the hull to the foredeck and open it up. The plastic is rigid and you have to use a lot of force to get the sides to open. Porta-bote provides a specially cut board to assist with this: you stand on one side of the hull and push against the other, wedging the board between the two. Eventually the board is positioned to hold the hull open. 2. Insert the middle seat. The ends of the seats are inserted into metal supports that are riveted on either side of the interior of the hull. The seats don’t fit in the supports all that well. There is some wiggle room up and down and the angle of the supports is perpendicular to the hull, which is not ultimately in line with the seat’s horizontal orientation, because the hulls’ sides flair outward. Note: The seats have been totally redesigned in the Alpha series! 3. Secure the middle seat with wing nuts and washers. The Porta-bote ships with long thin cotter pins that are tied to the seats with thin string so they don’t get lost. 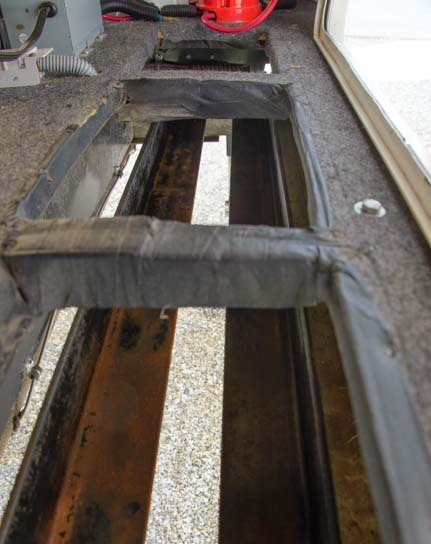 The cotter pins are intended to hold the seats in place against the metal hull supports, however they fly all over the place when you are carrying the seats, and they don’t hold the seats securely. Therefore, we replaced the cotter pins with long stainless steel eyebolts held in place with large stainless steel washers, both above and below the seat, and with a stainless steel lock washer underneath to keep everything tight despite the jiggling and jostling of the hull when the Porta-bote is driven over the waves. 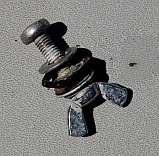 The eyebolt is slid through a hole in the upper part of the metal support, then through a hole in the seat and then through a hole in the lower part of the metal support, and a wingnut is screwed on from underneath. The eyebolts also come in very handy for holding the dink in place behind Groovy’s swim platform. We have two lines rigged on either side of the swim platform with clips on the ends that clip into the Porta-bote’s eyebolts on the forward and aft seats. This keeps the Porta- bote parallel to Groovy’s transom and keeps it snug to the swim platform for easy boarding. 4. Install the transom. The outboard mounting flap goes over the hull, and the metal L-brackets are attached to holes in the hull using bolts, wing nuts and washers. 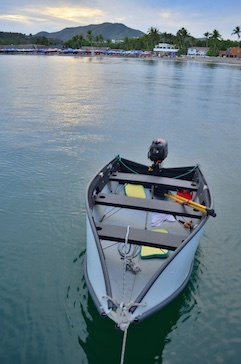 The Porta-bote ships with non-stainless bolts, nuts and washers, which are probably fine for the once-in-a-while lake fishing that the Porta-bote is built for. We replaced all these little pieces with stainless steel bolts, nuts and washers and added a lock washer to the set. The sizes of these pieces that Porta-bote ships are non-standard (I searched high and low for stainless components that would match the originals). Instead, we simply used replacement bolts, washers and nuts that would fit the holes rather than trying to match the thread pitch, bolt length and width of the ones from the factory. 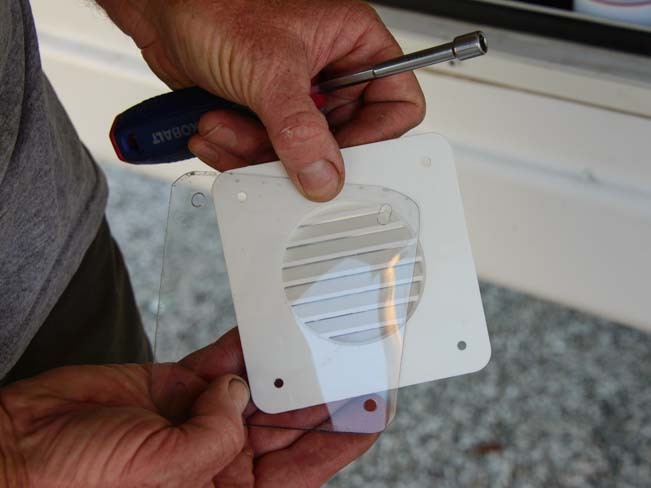 The lower wing nut / washer set on each side of the transom includes a rubber washer to keep that part of the boat watertight since that part sits below the waterline. The rubber washers last about 6 months in the salt water environment. We keep several spare rubber washers to use as replacements each time they wear out. In addition, we have a complete duplicate set of all the eyebolts, straight bolts, wing nuts and washers that we use for the Porta-bote, as it is all too easy to drop one of these tiny pieces overboard while assembling or disassembling the Porta-bote on deck. The worst aspect of the Porta-bote design for use as a cruising dinghy prior to the new Alpha series, is that you are fumbling with the very large pieces of a 10′ long hull, several wide seats that don’t fit into their supports very well, and a big heavy transom, all while screwing the whole thing together with tiny wing nuts. 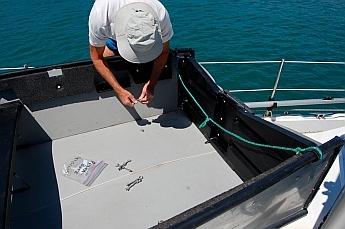 The bottom of the boat is a black plastic “hinge” that acts as something of a keel, so the boat doesn’t sit flat on deck but pivots about on this round tube of plastic. So when Groovy rolls in the swell, the porta-bote pivots on its keel, and you are hanging onto the boat in one hand with a fist full of wing nuts and washers in the other, all while trying to mate the threads of the wing nuts to the bolts. 5. 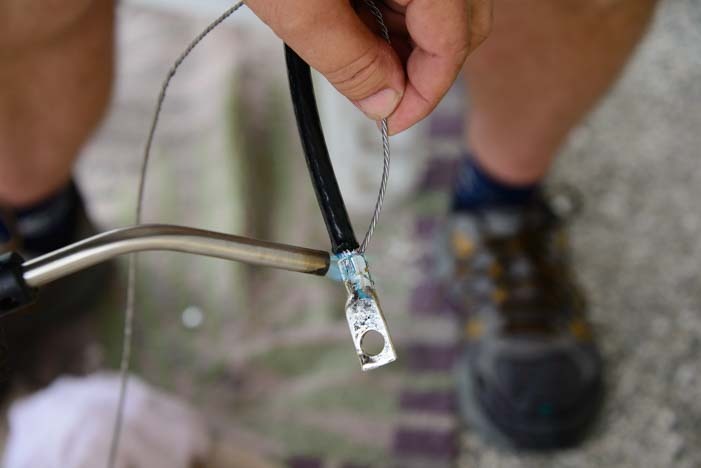 Raise the Porta-bote up and over the lifelines and lower it into the water using the spare halyard. We have an electric halyard winch that works really well but also works quite hard during this process (of course it would be a great upper body workout to winch it by hand). When the boat rises up in the air, the outboard mounting bracket flops down unless we clip it in place with a large clip before raising the boat. Note: This has been remedied in the new Alpha transom design. This part of the process can be tricky in a large swell or in high winds, as the boat is difficult for the guy on deck (Mark!) to control as it swings around on the halyard. 6. Move the boat to the swim platform, clip middle and rear seats’ eyebolts to two lines on Groovy’s transom to keep the Porta-bote parallel to Groovy’s swim platform for easy access, and install the other two seats. 7. Lower the outboard engine onto the mountain bracket on the transom (using one of the dinghy davits) and secure it in place. Rear seat is ready for installation. Note the 3 u-shaped metal legs. to keep it parallel to Groovy. The Porta-bote tows beautifully, and we have towed it (without the engine mounted), for hundreds of miles, a few times in some rather large and lumpy seas. We have towed it with the outboard mounted too, and that works just fine, but we wouldn’t want to go more than a few very sheltered miles towing it that way. We tie the Porta-bote’s painter to two points on Groovy’s transom, making a bridle. We usually tie a second line to Groovy as well, just in case. There’s nothing like trying to find and retrieve a lost dinghy in big seas (been there, done that!). We have tried towing the Porta-bote far behind Groovy, but have found it behaves much better when it is snugged up close behind. We keep it about a foot or so off of Groovy’s transom. Sometimes when we are sailing slowly in lumpy, following seas it has a tendency to run into the back of Groovy. We had a custom made stainless steel arch extension built for our boat to support our 555 watts of solar panels and to provide telescoping davits to hoist the Porta-bote. We drilled two holes on the stern end of the Porta-bote just forward of the transom, one on each side of the hull. We had four stainless steel plates made to reinforce these holes, and those are bolted in place (with stainless bolts), one plate on the inside and one on the outside of each hole, sandwiching the plastic hull in between. 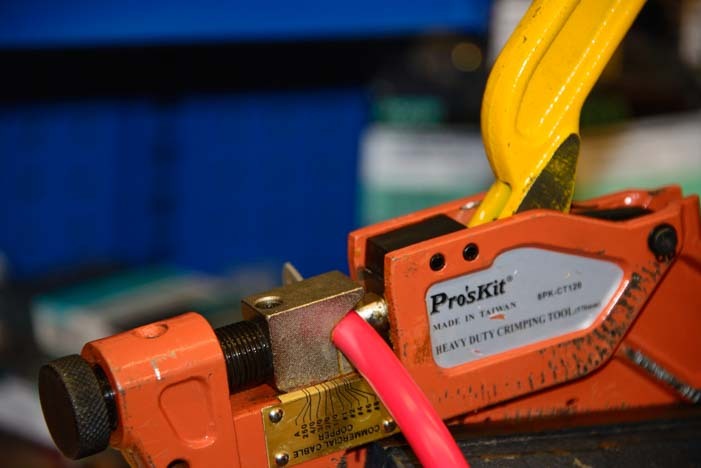 To create a davit bridle, we simply run a line between those two holes in the hull’s stern and run another line between the two factory-installed holes in the bow of the boat to make a two-point hoisting system for our davits. 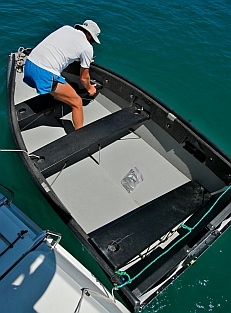 Because the lifting points are at the top of the hull, it is not possible to snug the Porta-bote tightly into the davits. Instead, it always swings a little, no matter how high you hoist it. If the lifting points were in the bottom of the boat, the top edges of the hull could be pulled flush to the davit arms. However, I am not sure how to install lifting points in the boat’s floor. So we don’t travel with the Porta-bote in the davit system. We raise the Porta-bote out of the water onto the swim platform at night. The davits are ideal for getting the boat out of the water at night when we are at anchor, as the Porta-bote sits snugly on the swim platform and we secure it with lines tied to the seats’ eyebolts to keep it perfectly still. Also, if it rains (which it doesn’t do in Mexico’s winter cruising season) or if there is a lot of dew, the boat doesn’t have a drain hole to release the water. Water also collects in the bottom of the boat when we drive it hard, as waves splash in and water jumps over the transom. So there is occasional light bailing to be done, but not more than a sponge or towel can handle. One thing we discovered is that the Porta-bote’s black plastic seam tubes that run along the length of the hull are made of a plastic that leaves scuff marks on Groovy’s white fiberglass gelcoat. When we hoist the dinghy in the davits, it invariably bumps along Groovy’s transom a bit, and over time it leaves a lot of marks. They come off with a little elbow grease and polish, but there are plastics out there that are non-marking, and if Porta-bote used that kind of plastic it would be a huge improvement. Just beneath the black plastic lip at the top of the Porta-bote hull there is a strip of foam rivited to the hull. This provides enough flotation to keep the boat afloat if it fills with water — as long as there is no outboard engine mounted on the boat. The foam material deteriorates in the sun and flakes off, constantly leaving little black flecks all over the Porta-bote’s floor. I have heard of cruisers covering this foam with Sunbrella to keep it intact and prevent its total disintegration. I haven’t gotten to that project yet… This foam provides a little flotation, but the Porta-bote will definitely sink if it is swamped while an outboard engine is mounted on its transom. The interior volume is enormous. We have packed it with a month’s worth of groceries (at the supermarket the provisions were mounded way above the top of the shopping cart) along with three weeks worth of laundry (in two huge laundry bags), plus ourselves, and we still had space leftover. We have also loaded it with five adults and putted along at a good clip. I think six adults would be pushing it. There is plenty of space on the seats for six adults, but the boat would sink too low in the water. 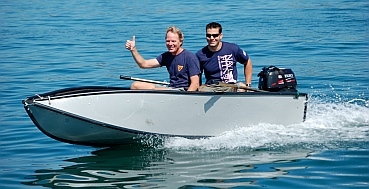 It is a fast boat that planes easily with both of us aboard using just a lightweight 6 hp 4-stroke outboard. 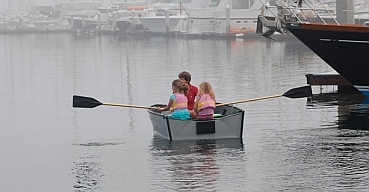 We raced a traditional RIB dinghy driven by a 15 hp outboard and carrying two adults. They barely pulled away from us as we reached about the quarter mile mark. The Porta-bote is lots of fun. I love rowing, and the Porta-bote is a lot of fun to row. It tracks well and moves nicely through the water. For the passionate rower the oars are totally inadequate and should be replaced. The oarlocks in the hull also seem a little flimsy to me and I wonder how long they will hold up, as they flex ominously with every pull on the oars. 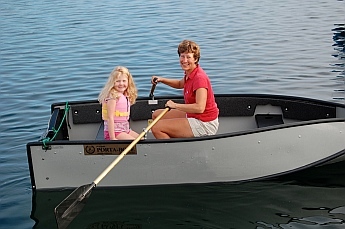 The oars themselves are made for very light, occasional use. They are aluminum and they split into two halves for stowage, the handle half and the paddle half. 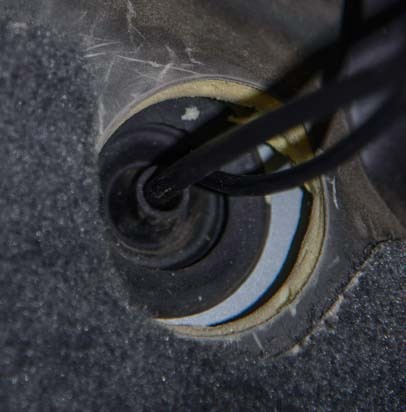 The two halves are joined with a plastic pin-through-a-hole system, but the pin doesn’t actually go through the hole very well because the plastic spring mechanism is flimsy and weak. So, the oars are prone to coming apart if you don’t keep an eye on them. Each oar has an aluminum pin that fits into the hole in the Porta-bote’s oarlock. The pin is held in place on the oar with a sleeve around the oar that is fastened with an aluminum bolt and wing nut. On our fifth time out rowing, the bolt on one of our oars crumbled mid-stroke. We replaced the bolts and wing nuts on both oars with stainless steel, and they have been fine ever since. Over our four year cruise, we did not end up rowing the Porta-bote but used the outboard all the time instead. Whether rowing or motoring, it takes a while to get used to the Porta-bote’s flexible floor. You can feel every wave and bump under your feet, and it is a very moveable platform, nothing like a hard dinghy or a RIB. However, the movement is just part of the package, and once you are accustomed to it, it’s kinda neat. The Porta-bote is a great cruising dinghy. All-in-all we are very happy with the Porta-bote. No cruising dinghy is ideal, each type being a pain in the neck in at least a few ways. 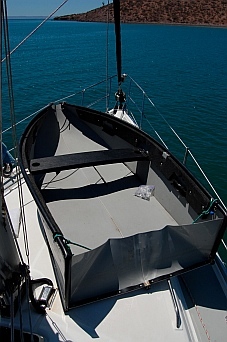 We like the lightweight nature of the Porta-bote and being able to get most of it off the deck and out of the davits and out of the way while on a long passage. We like its good manners while towing, its speed under power and its voluminous interior space for provisioning runs. The compromises and required upgrades are okay with us in return for its many good qualities. 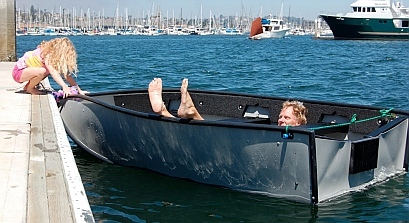 If Porta-bote ever went back to the drawing board and studied its plans and re-engineered the boat for use as a cruising dinghy, they could create a truly superior dink that surpassed everything else on the market. As noted above, Porta-bote did just that, and the result is the new Alpha series! Check out our review of the Hobie i14t Tandem Inflatable Kayak and our Cruising Tips for Mexico. Here is a summary of our cruise with links to all our sailing blog posts, as well as some anecdotes from the ex-pat cruising life, and a list of guide books we used for our cruise. We sailed on a 2008 Hunter 44DS sailboat (more pics here) with a 60 gallon/hour watermaker and 555 watts of solar power. For cruisers heading to Pacific Mexico, we’ve created a VIDEO SERIES. 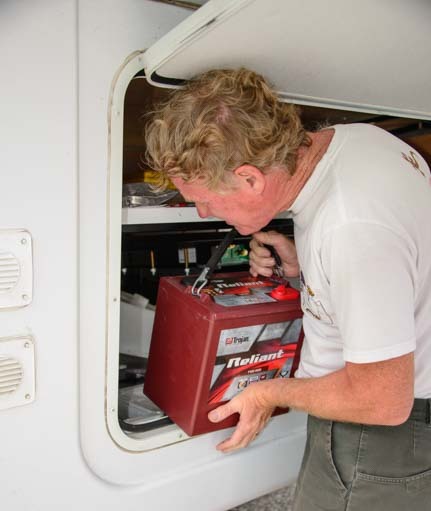 The engines in most cars and trucks are computer driven these days, but the installation of an engine tuner puts the driver in the driver’s seat instead. An engine tuner, or programmer, gives the driver the ability to fine tune the engine’s efficiency and performance by manipulating the computer’s input parameters to suit the driving task at hand. 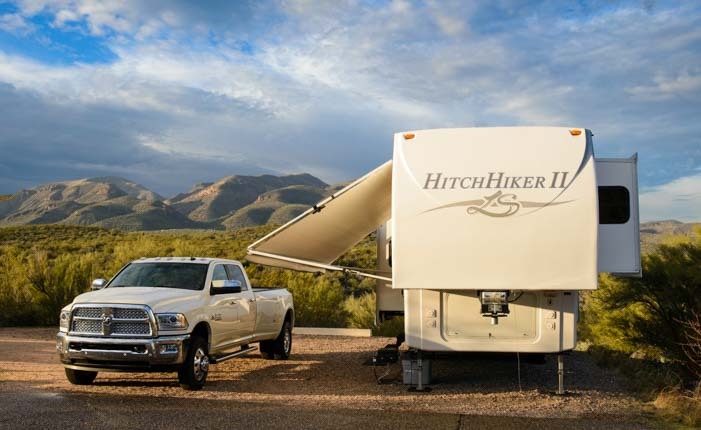 Since 2007, we have lived year-round in a 14,100 lb, 36′ 2007 NuWa Hitchhiker fifth wheel trailer. For eight years, the truck we used to tow this big trailer was a 2007 Dodge Ram 3500 Single Rear Wheel Long Bed truck. Half of our miles driven, we towed the trailer. The other half, we drove it around town with nothing in tow and a few hundred pounds of cargo the bed of the truck. Once in a while we threw in an off-road adventure just for fun. When the truck had 85,000 miles on it, we installed an Edge Diesel Evolution CS tuner, and what a world of difference that made to our driving experience, not only when we were towing but also when we were driving the truck around without the trailer attached. Given us a readout for the transmission temperature. And it was an easy installation to boot. We also installed an optional companion product, the Edge EAS Exhaust Gas Temp sensor which gives us another piece of crucial temperature data when we are towing under heavy load. This is not a mandatory installation. We couldn’t be more pleased with these upgrades! Our truck with our fifth wheel trailer attached. 1. Why Install an Engine Tuner? 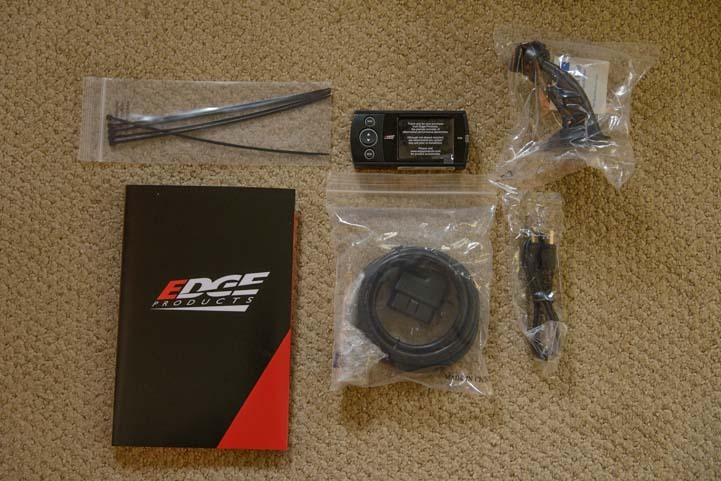 We first became interested in the idea of installing the Edge Evolution CS tuner when Mark saw an article in the October 2014 issue of Diesel Power Magazine (“Tested, Proven, Validated — Edge’s DPF-On Tuner Walks the Walk”). 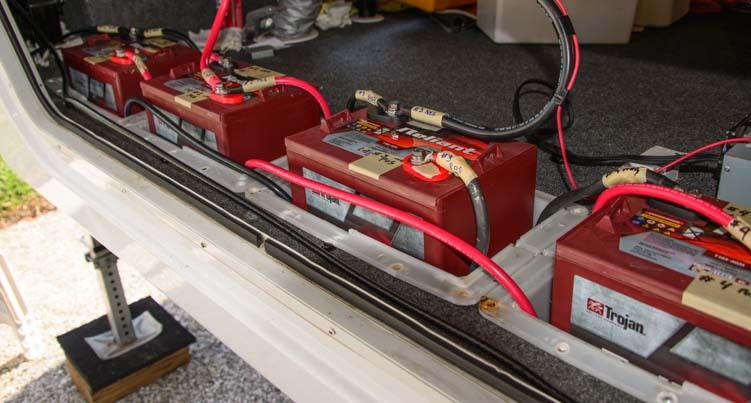 This article discusses the improvements the tuner had made on our exact model truck (well, a 2009 rather than a 2007, but with everything else virtually the same, including the mileage!). 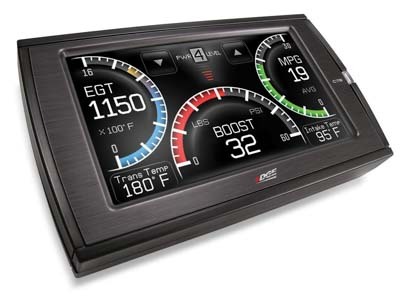 The Edge Diesel Evolution Tuner works on Ford, GM/Chevy and Dodge RAM. The Edge Tuner is mounted on the windshield, low enough not to restrict visibility but still easy to see. The beauty of the Edge programmer is that it doesn’t change anything in the engine permanently. 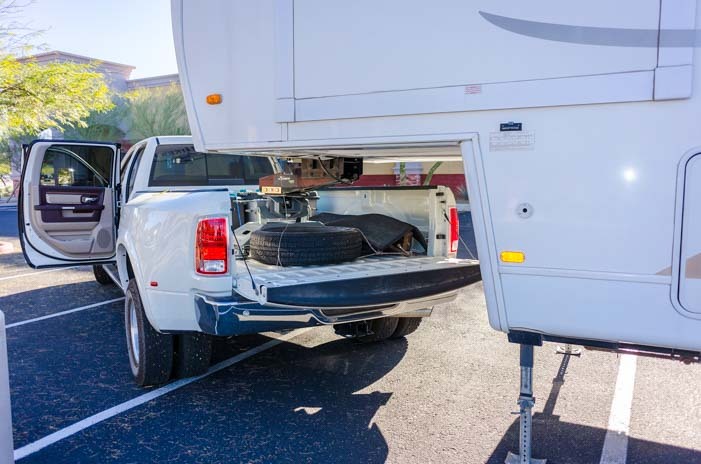 It simply gives the driver the ability to fine tune the engine for its specific job at the moment, whether that is towing a big trailer, carrying a heavy load in the bed, racing off-road, or driving around town. 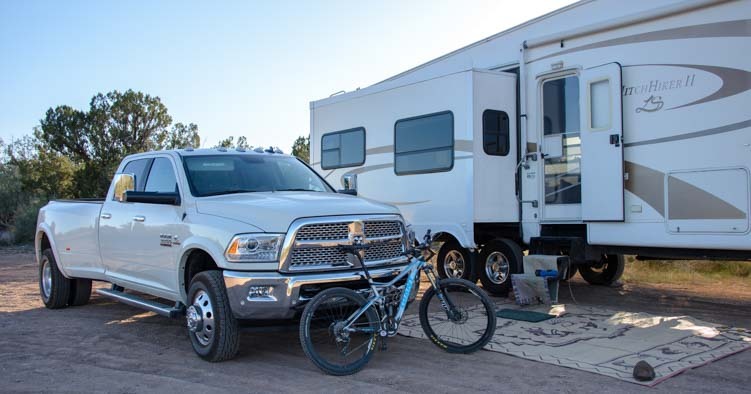 Light duty diesel trucks (i.e., Ford 250/350, Chevy 2500/3500 and Dodge RAM 2500/3500) are built for many uses, from towing heavy horse and RV trailers, to off-road racing, to driving across town and across country carrying big loads. The on-board computer of every model truck is programmed at the factory to be able to do each of these things pretty well. However, it is impossible to program the computer to operate the engine at peak performance in all conditions. To make things worse, the truck manufacturers don’t provide the driver with a way to optimize the engine’s performance or to monitor some of the data the computer has already gathered. Much of the truck computer’s capabilities and data remain inaccessible to the driver. This is where the Edge tuner comes in, because it allows the driver to fine tune the engine for the immediate job at hand. 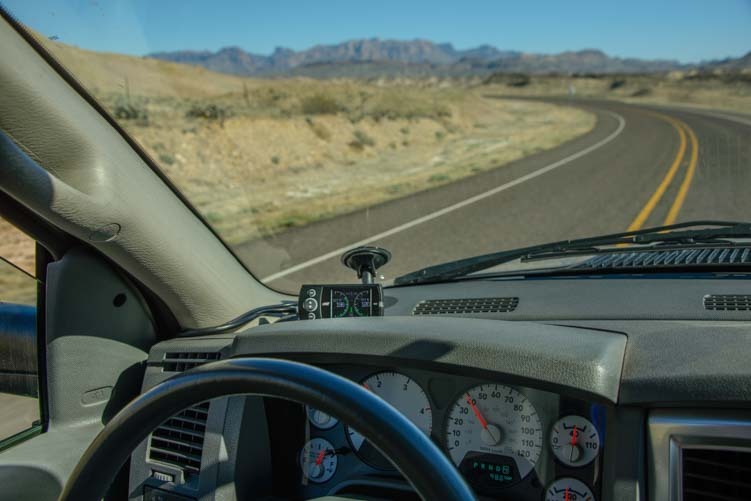 The idea behind the Edge tuner is to put the programming power into the hands of the driver, and to provide gauges for monitoring much of the data that the engine’s sensors detect. 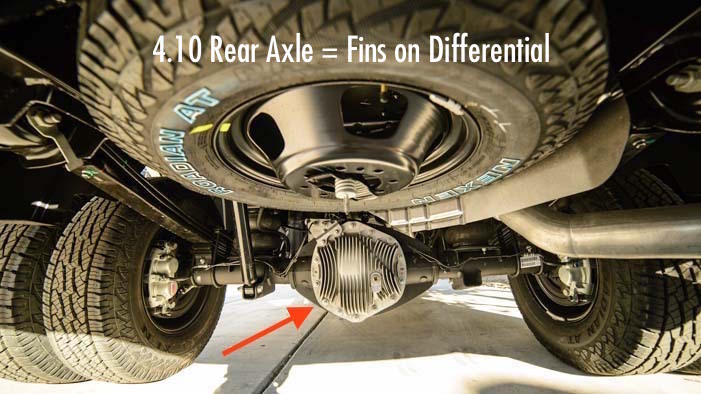 The Edge tuner can program the truck’s computer to maximize towing power or maximize non-towing fuel efficiency, depending on the kind of driving you are doing that day. 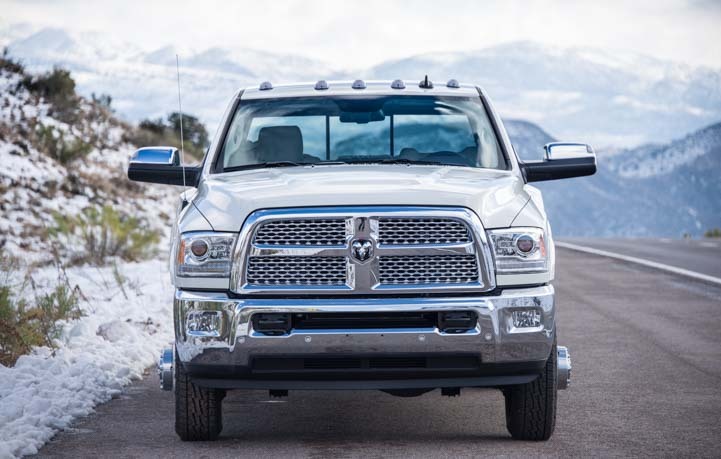 It can also set the truck’s computer back to the stock factory settings, which is important if the truck is going into the shop for repair. 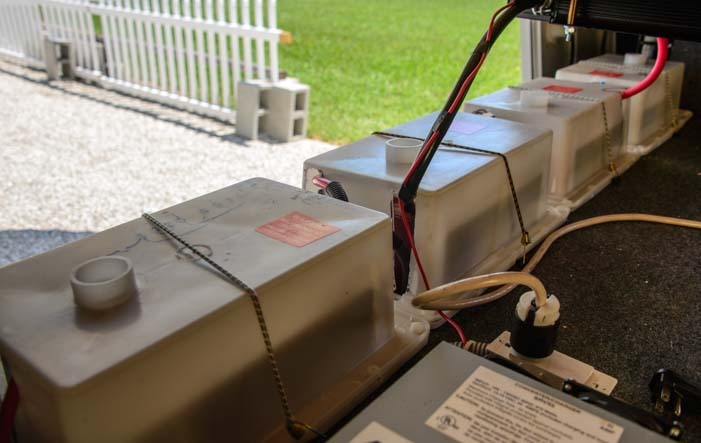 Because nothing mechanical is modified or tampered with, this means that nothing whatsoever is lost by installing the Edge tuner, but a whole lot is gained. 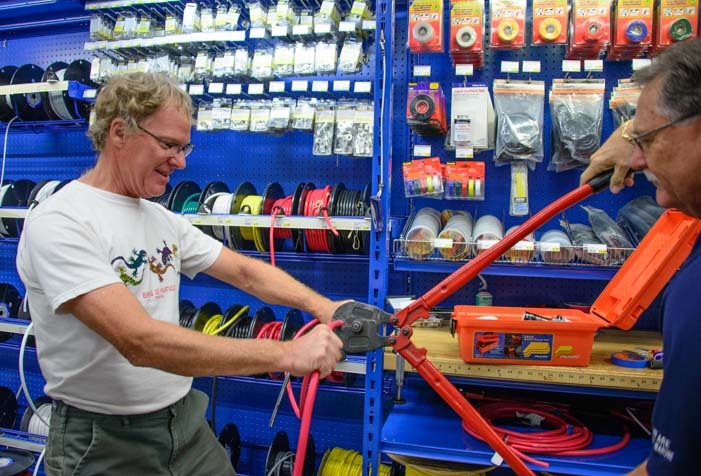 We were intrigued by the Edge tuner because the installation appeared to be very easy, and the results were absolutely terrific. 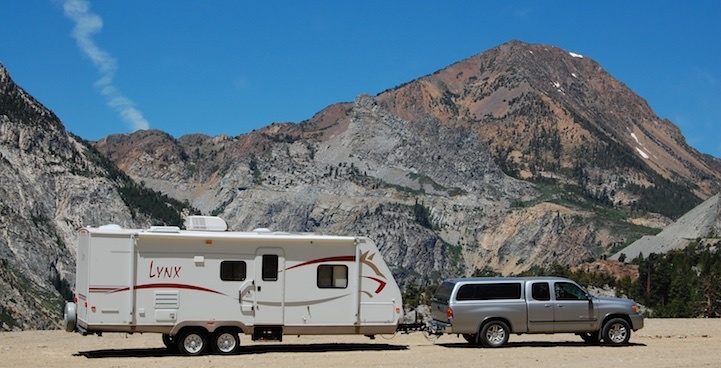 We tow our big fifth wheel trailer over huge, nasty mountain passes in the western states on a regular basis in the summertime, often tackling 10% and 15% grades on secondary roads. A little more towing power would be awesome! Engine Coolant Temp (left), Exhaust Gas Temp (middle bar), Transmission Fluid Temp (right). From the factory, most trucks display ONLY the Engine Coolant Temperature. So, the Edge tuner would allow us to monitor the transmission temperature as we drove over mountain passes. This is vital data that is not accessible with our standard engine temp gauges. Installing a companion product, the Edge Products EAS Exhaust Gas Temp sensor would let us monitor the exhaust gas temperature as well. Data from this optional sensor is shown in the middle gauge in the above image. You see, the factory installed engine coolant temp gauge in the truck cab tells only part of the story! 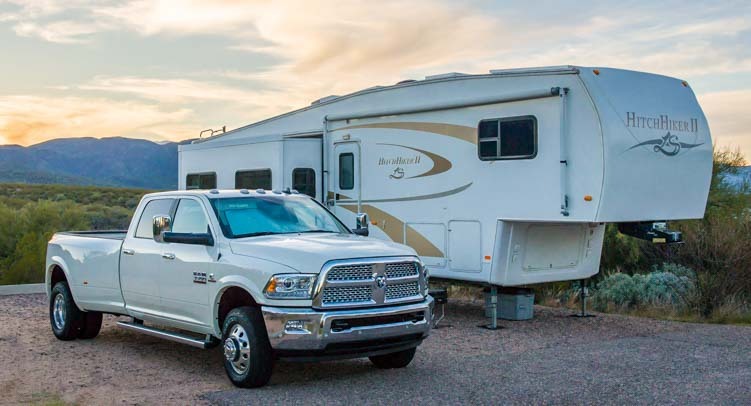 We’ve always wished for a little better fuel mileage, both towing and when we are driving around town without our house attached. The tuner’s Level 2 programming mode promised improved fuel efficiency in non-towing conditions. As it turned out, the tuner has increased our truck’s fuel efficiency in all situations. What about the truck’s warranty? A tuner (or “programmer”) does not permanently modify the truck’s computer or engine. There are “chips” on the market that make a permanent modification, but tuners and programmers don’t fall into that category. 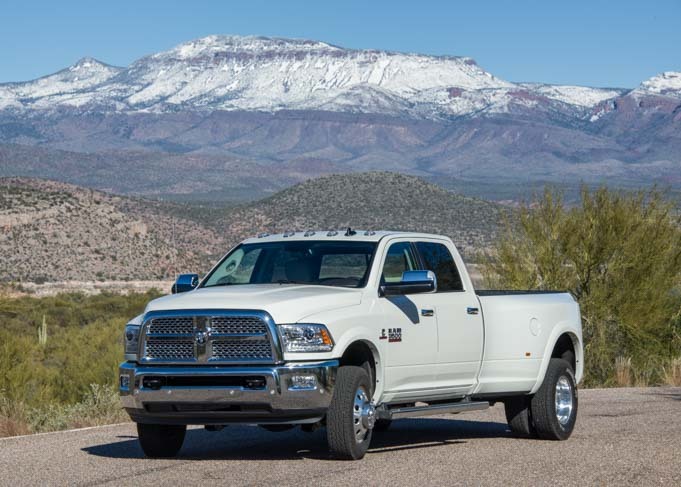 We have called a few Dodge dealerships, and they have all assured us that if we had a truck that was in warranty (ours is not), they would service the truck even if it had an Edge tuner installed in it. Their recommendation to us was to reset the Edge tuner to “Stock” and then unplug it from the OBD-II port under the dashboard before bringing it in for service so they could properly analyze the engine (they use OBD-II port for their diagnostics). The dealerships did say that if they found service was needed because of the presence of the Edge tuner (for instance, the tuner failed and shorted something out), they wouldn’t warranty that work, but they said the Edge tuner itself would not void any warranties. 2. 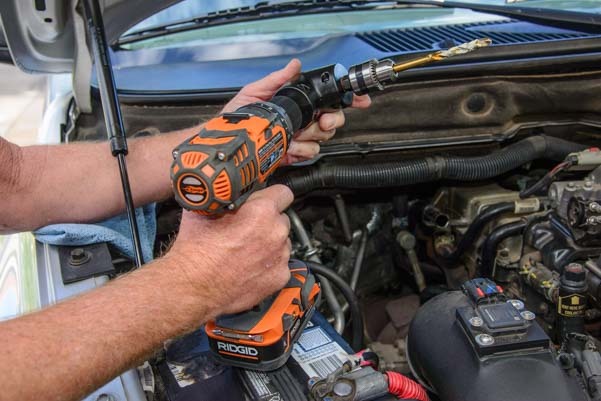 Edge Diesel Evolution Tuner – Tested and Validated! It’s easy enough for manufacturers to offer a bunch of sales hype and fake claims about a product like this, but the aspect of the magazine article that really got our attention was that the folks at Diesel Power did a controlled experiment to measure both the horsepower and torque that this tuner generates. 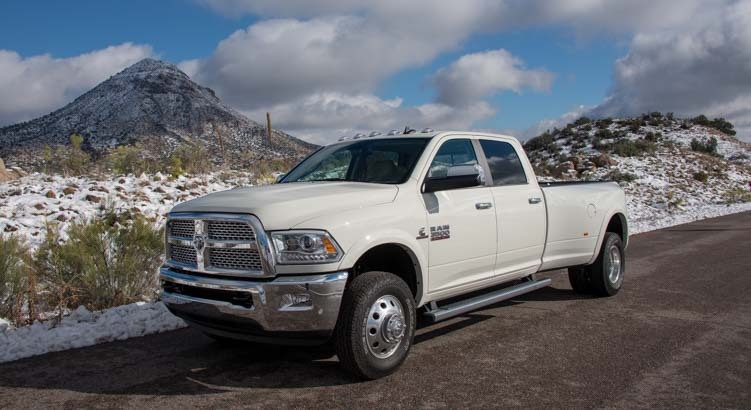 First, they put a stock 2009 Dodge RAM 3500 on a dynamometer and took horsepower and torque measurements. Then they installed the Edge tuner on the same truck, put it back on the dynomometer, and did the measurements a second time. So, they saw a jump of 41 hp, 106 ft-lb torque and a drop in peak exhaust gas temperatures. Wow!! The Edge Tuner suddenly became a “must have” for us. The installation took a total of 90 minutes, from opening the box, to sitting down and reading the manual, to getting the unit installed in the truck. Very easy. In fact, it was so darned quick that Mark had completely finished the installation before I got my camera out to get pics of the unit going in. You just mount the display unit on the windshield with the suction cup mounting bracket, plug the unit to the OBD-II port, use the tie wraps to dress it all up, and you’re done. So I guess I didn’t miss much! 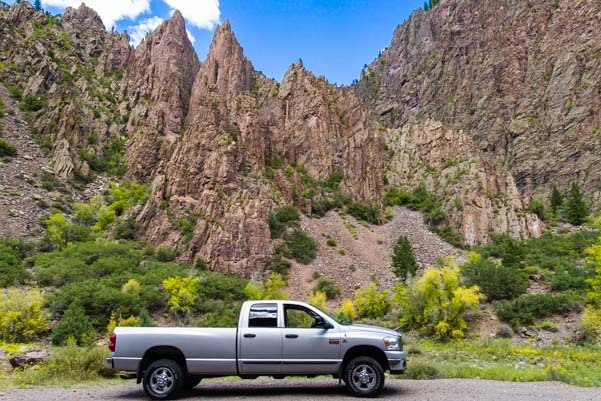 When we installed the Edge tuner on our truck, we just happened to be staying at the base of one of the biggest mountain passes we have ever traversed with our truck and trailer, the Million Dollar Highway that runs through the Colorado Rocky Mountains between Ouray, Silverton and Durango, on US Route 550. 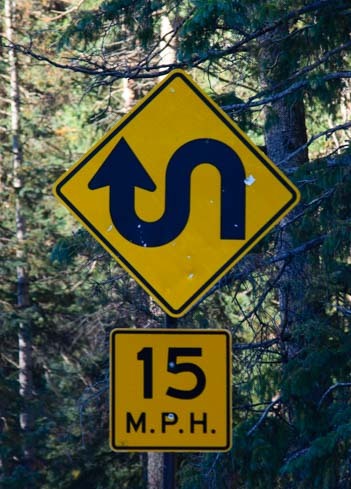 This hair-raising, 70 mile stretch of road winds through dozens of 10 mph, 15 mph and 20 mph hairpin turns, going up and down grades that the Colorado Department of Transportation rates at “7% or more,” with some folks claiming a few are in the 9% range. To add a little excitement to the drive, this is a fairly narrow two lane road with steep, unprotected drop-offs. 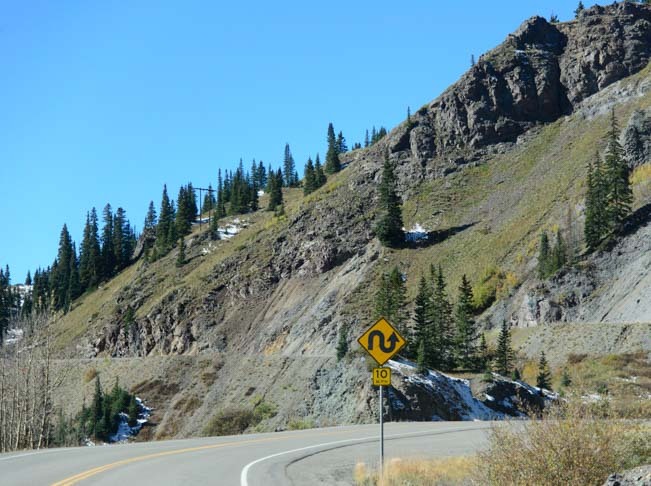 After finishing the Edge tuner installation, we took the truck up and down the first part of this road between Ouray and Red Mountain Pass about a dozen times. Mark set the tuner to Evolution Level 1, and he felt the difference in performance immediately. 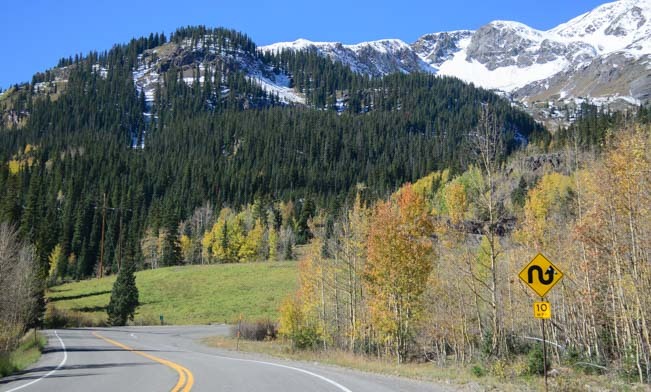 Once he was comfortably familiar with the road and the mountain passes, and once we were ready to leave Ouray, we hitched the trailer to the truck and drove the entire Million Dollar Highway — Route 550 — over those three mountain passes from Ouray through Silverton to Durango. Mark was impressed that the truck had plenty of power at all times and made it up and over the passes without straining. He kept the engine torque in its power band of 2,200 to 2,600 rpm, and he never had to depress the gas pedal all the way to the floor to maintain a safe speed. You can set up the Edge tuner display to show whatever data interests you most. On the CS model (which we installed), there are two large analog displays with accompanying digital readouts and a smaller digital display in between them. 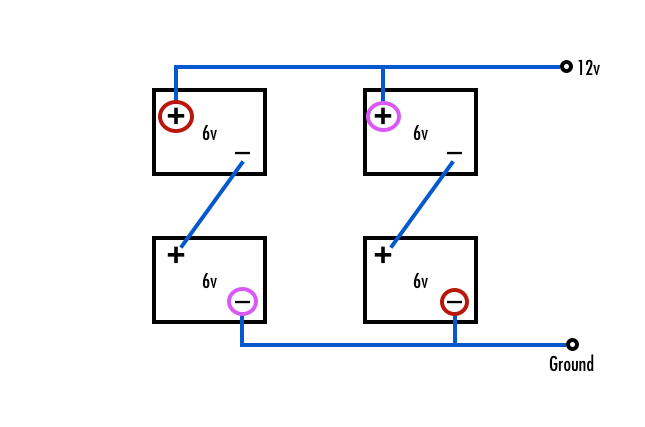 The CTS model (which is slightly more expensive) has three analog displays with accompanying digital readouts. Mark had set up our tuner to show the Engine Coolant Temp (ECT) and the Transmission Fluid Temp (TFT) on the two large semi-circular analog gauges to the left and right. 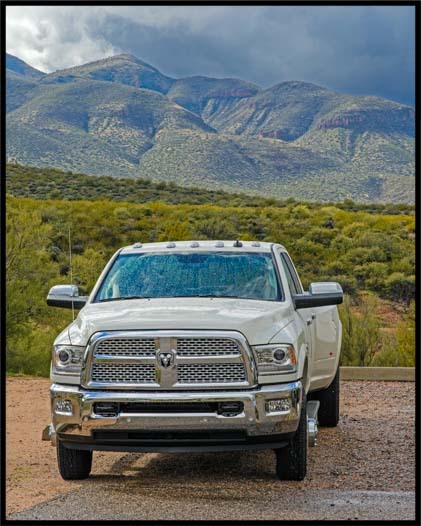 The ECT is a measure of the antifreeze temperature in the radiator, and is the “engine temperature” reading that is given in an analog gauge on the truck’s dashboard. It is also the temperature that most manufacturer’s use to indicate that the engine has overheated, usually displaying a big red light on the dash. Despite the hairpin turns and sheer drop-offs, semi-tractor trailers and RVs traverse this highway all the time. The TFT is a measure of the transmission fluid temp, and it is not a value that is tied into any of the dashboard instrumentation on most trucks. In general, both the ECT and TFT temps should be kept below 225 degrees, although newer trucks can run slightly hotter than older trucks. The digital readouts on the Edge tuner display unit are big numbers that are easy for both the driver (and passenger) to read. What a shock it was to begin our first big ascent on Red Mountain Pass and to see that while the Engine Coolant Temp was in the normal range, according to both the factory-installed in-dash gauge and the Edge tuner (which showed 215 degrees), the Transmission Fluid Temp went into the red zone, climbing past the safe zone of 225 degrees up to 237 degrees. The ascent was almost over when we hit this max, and both temps quickly dropped back down as we descended towards Silverton. The ECT cooled down to 198 degrees and the TFT cooled way down to 163 degrees. 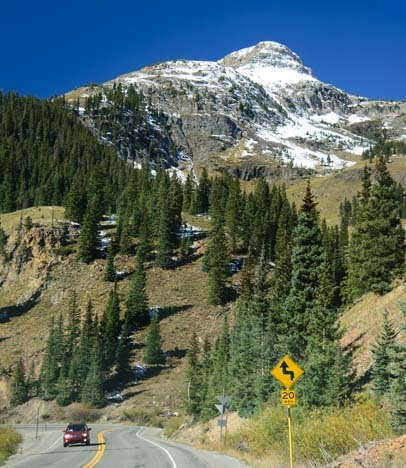 On the next ascent, Molas Pass, (10,970′), the Engine Coolant Temp climbed back up to 215 degrees (still in the safe zone) while the Transmission Fluid Temp topped out at 244 degrees. that’s just the antifreeze. The transmission fluid temp (right) was 19 degrees too high. In the next valley, the temps dropped back down again, and on the last ascent, Coal Bank Pass (10,640′), the temps climbed again, but this time the Transmission Fluid Temp stayed below 235 degrees. We were both amazed that the truck never overheated, according to the dashboard Engine Temp gauge, but in fact, the transmission had exceeded its limits by as much as 19 degrees, or 8%. 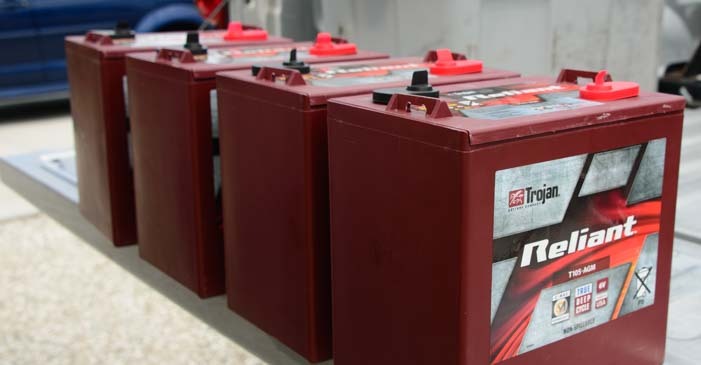 We never would have known that without the Edge tuner, and it made us wonder just how hot the transmission fluid would be in the event that the engine coolant temp actually went into red alert. 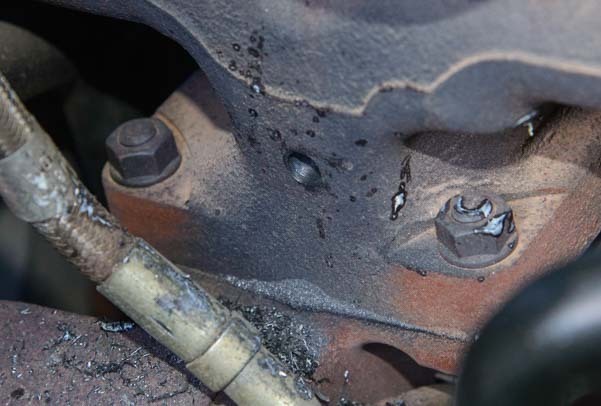 If the transmission stays over 225 degrees for too many minutes, the transmission fluid breaks down permanently, and the transmission can be irreparably damaged. You can set up alerts in the Edge tuner display so that buzzers sound and/or the display flashes when any of the data being monitored exceeds its maximum. However, by default, the alert system is turned off. This makes sense, as it could be annoying to have a buzzer going when you are already nervously looking for a way to safely pull over to let the engine cool. For anyone installing the Edge tuner, just keep the magic number 225 in mind, and you will easily see when you have exceeded that value on the tuner’s display, as the numbers are nice and large. There is also a “red zone” on the analog display, but we found it was so faint that we did not notice it until we studied our photos of the gauge afterwards! When we tow, we set the Edge tuner to Level 1. When we are not towing, we set the Edge tuner to Level 2. 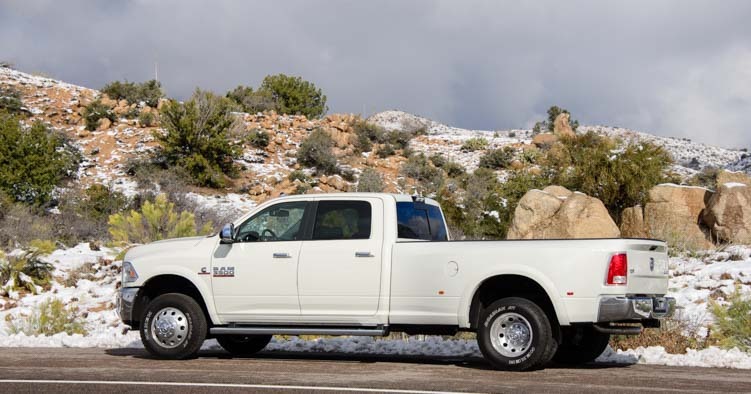 Increased MPG – Towing – Improves by 2 MPG! 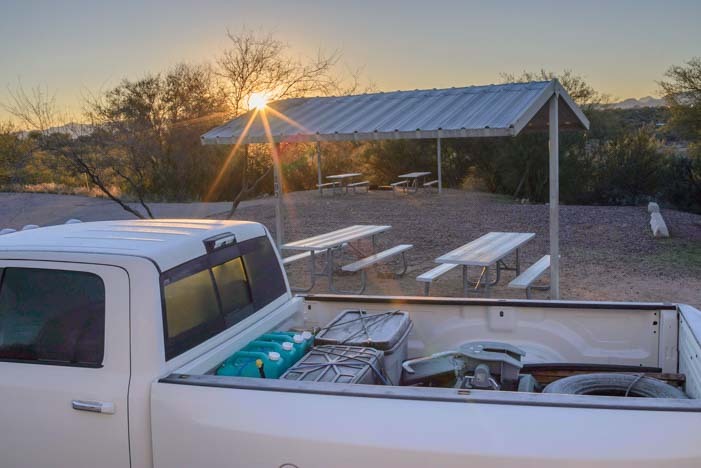 Before we installed the Edge tuner, we typically got somewhere between 9.7 and 10.5 mpg while towing for long distances, according to the electronic gauge in the truck. This gauge has its limitations, because it is somehow averaging the most recent miles driven, but I have not been able to find exactly how the average is calculated or how many miles back it goes — is it the most recent 100 miles? 500? 1,000? 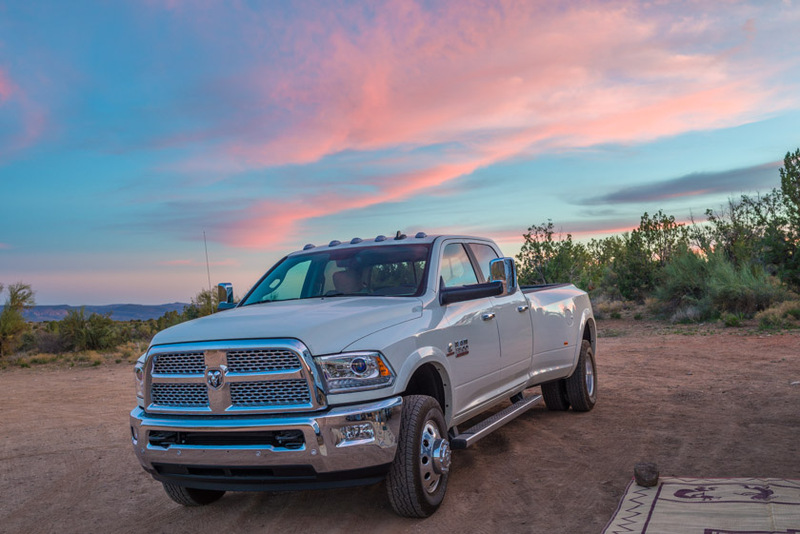 Measuring the MPG from one full tank of diesel to the next is a more accurate method, but it is still fallible because one tank may be filled slightly more than another, and if the tank of gas includes both towing and non-towing miles, then the numbers are thrown off. So, I can’t offer scientifically collected numbers here, but I can say that after we installed the Edge tuner, the gauge in our truck now typically shows numbers between 11.7 and 12.5 when we are towing consistently for distances of 250 miles or more. 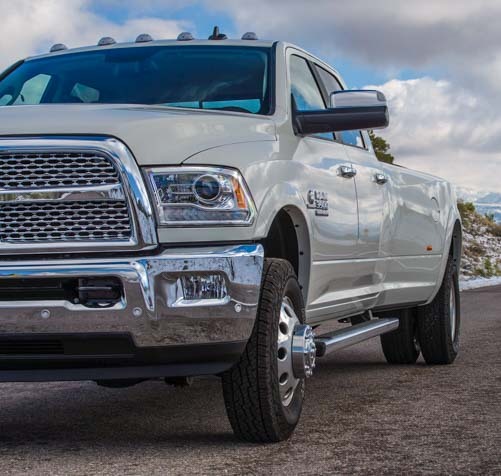 In essence, the truck is saving 2 miles per gallon while producing more power. Very impressive! 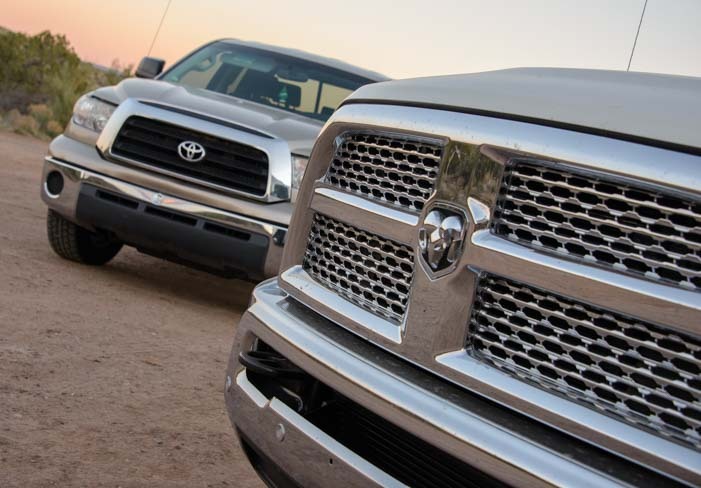 Increased MPG – Not Towing – Improves by 3 MPG! Our truck always used to get somewhere in the 16-18 MPG range when we weren’t towing, better on highways and less in town. 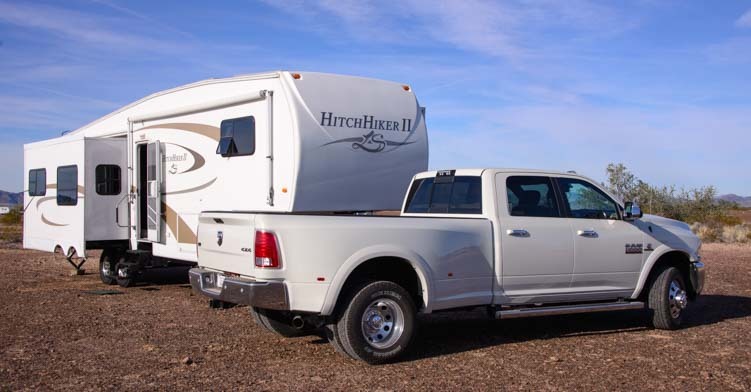 Now, if we travel 100 miles or more without the trailer, we see an MPG in the 19-21 range. That is an improvement of 3 MPG! What a shock it was the first time we drove 130 highway miles at 65 mph and saw 21.6 MPG on our truck’s mileage gauge!! If this fuel savings alone were used to justify the cost of a new Edge Evolution tuner, how many miles would we have to drive for the unit to pay for itself? If we assume the tuner costs ~$450 and diesel costs ~$3/gallon (both rough but reasonable estimates given prices in the last year), and we assume a conservative savings of 2 MPG, whether towing or not, and we tow for half the total miles driven, we will have saved approximately $450 in fuel once we have driven about 15,500 miles. 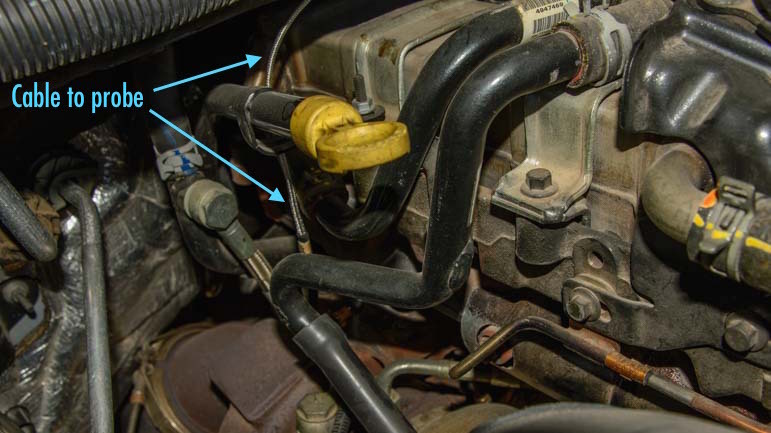 A month after installing the Edge Evolution CS tuner, Mark installed a companion product, the Expandable Accessory System (EAS – product #98603) Exhaust Gas Temperature sensor. 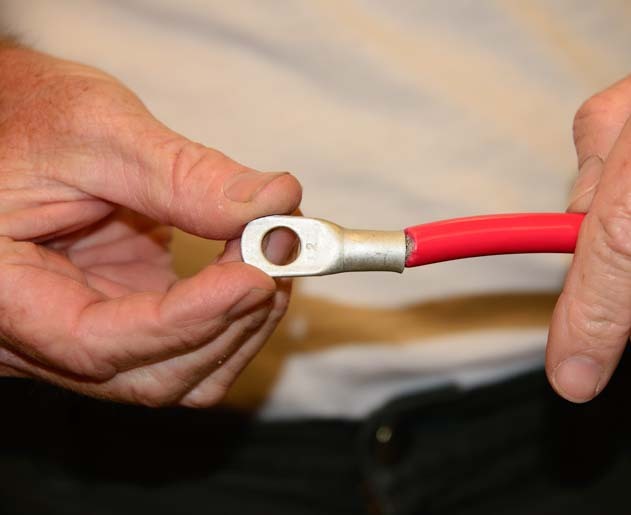 This product measures the temperature of the exhaust gases in the exhaust manifold, giving the driver yet more insight — beyond just the antifreeze temp and the transmission fluid temp — into how hot the engine is running. 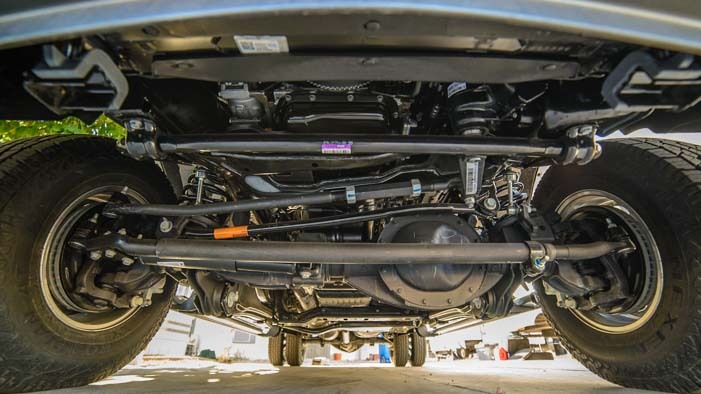 This was an optional installation, but after seeing the value of knowing the transmission fluid temperature, we wanted to be able to monitor our exhaust gas temperature readings as well. This installation was quite a bit more complicated than the Edge programmer, as the probe had to be inserted into the exhaust manifold. 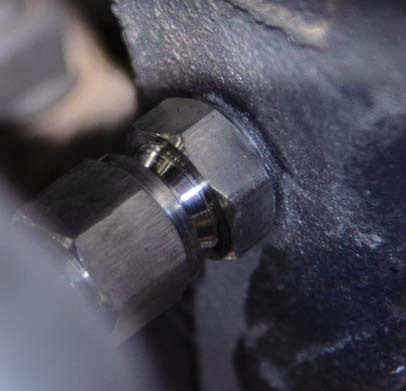 This required drilling a hole in the exhaust manifold, tapping the hole, screwing the probe into the newly tapped hole, and running the wires through the engine firewall back to the Edge Evolution tuner where they plugged into the back of the display unit. The hardest part of this installation was drilling and tapping the hole, in part because the exhaust manifold is not super easy access to with a large drill, and in part because the metal of the exhuast manifold is very thick and hard. The most important thing is that the tap handle be big and solid to give you lots of leverage, because the solid cast iron on the exhaust manifold is very thick and very hard. This will make the difference between an easy installation and a miserably hard one. As always, Mark got the project underway before I got my camera going, so I don’t have a “before” photo. However, the “after” photo below shows what you’re gunning for and what stands in the way between you and the exhaust manifold. 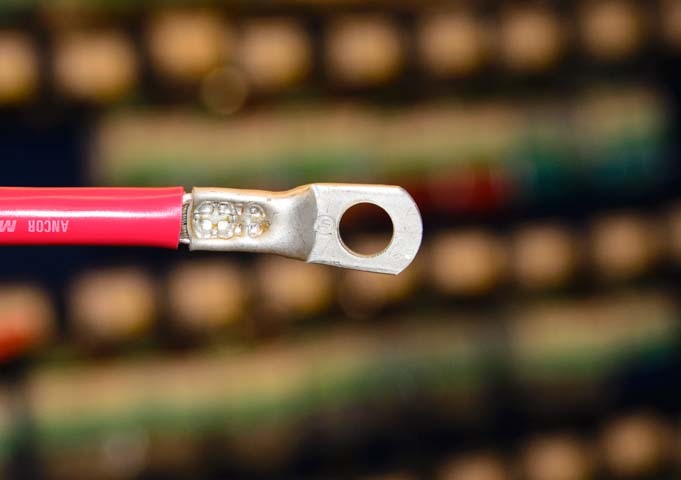 Completed installation with only the braided stainless cable for the probe showing. First, unscrew the bolt holding the two black tubes in place so they can be pushed aside. The probe will be inserted here. Space is tight, so a 90 degree right angle drill is necessary. Drill a pilot hole first. Then drill the real hole for the probe. 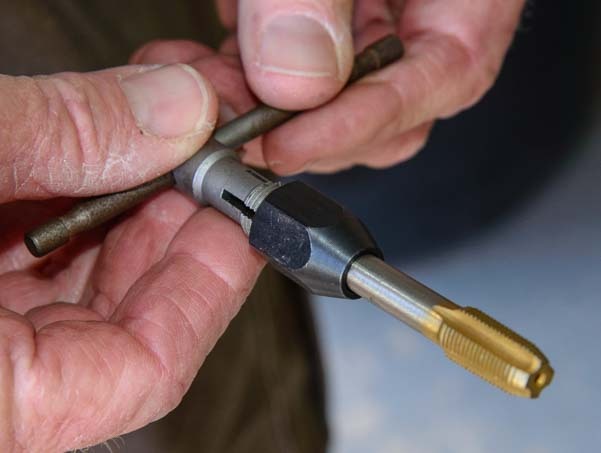 In order to avoid getting metal filings in the wrong places, grease the drill bit first. Drill a little, then wipe the drill bit down, re-grease it, and drill a little further. Do this for both the pilot hole and the real hole. Now the hole is ready to be tapped. Grease or oil the tapping tool well, and work it in and out a quarter turn at a time. As before, after a few turns, back it all the way out and wipe off the metal filings, and re-grease it. As mentioned above, a small tap handle will not give you enough leverage for the thick, hard cast iron of the exhaust manifold. An undersized tap handle will make the job very difficult. Get a big, sturdy one! 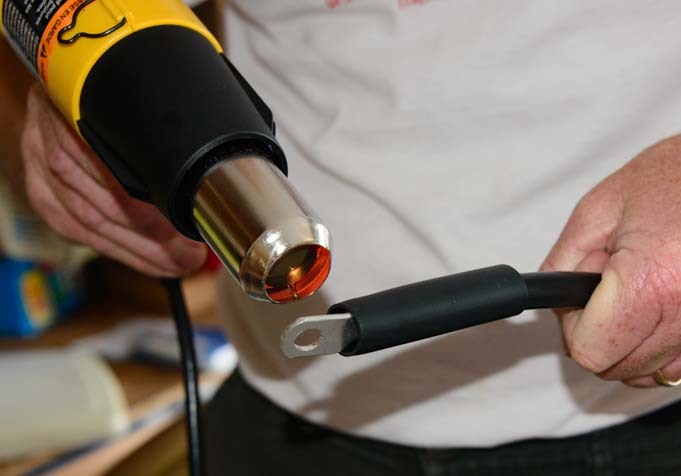 Once the hole is drilled and tapped, the probe can be screwed in. 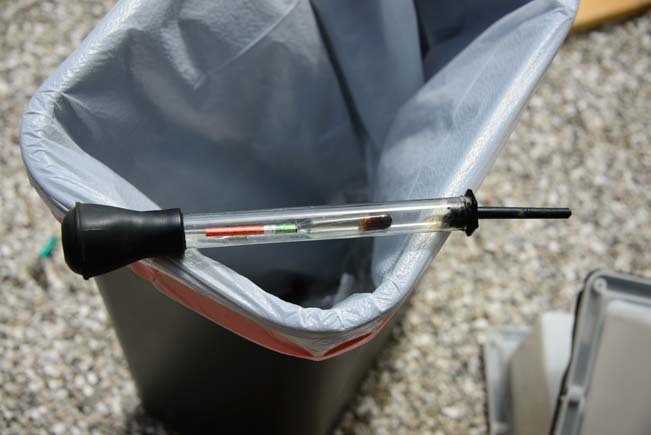 Grease the probe’s threads with <strong>Permatex Anti-Seize Lubricant first. Then, a cable connecting the probe to the Edge tuner is run from the exhaust manifold back through the engine firewall between the engine and the cab, and on up to the tuner. Mark opted to put the display for the exhaust gas temperatures in the middle display area between the Engine Coolant Temp and the Transmission Fluid Temp. Of course, you can choose to display any data in any of the three display areas, and Mark experimented a little before settling on ECT on the left, EGT in the middle and TFT on the right. The more expensive Edge Evolution CTS tuner has three large displays with both analog and digital readouts rather than the two large displays and one small one on the Edge Evolution CS tuner. 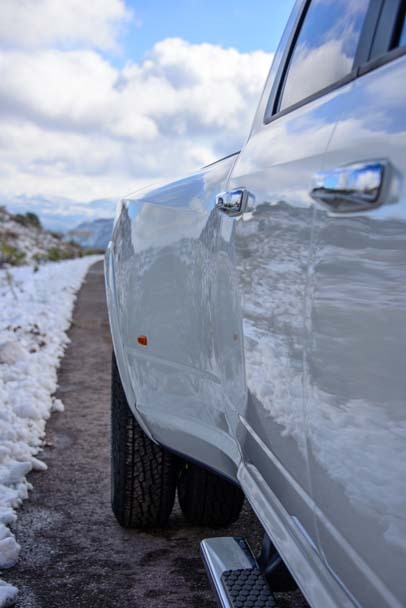 We installed the Exhaust Gas Temperature probe after we had done all of our mountain driving for the season, so we have yet to test it in the mountains. 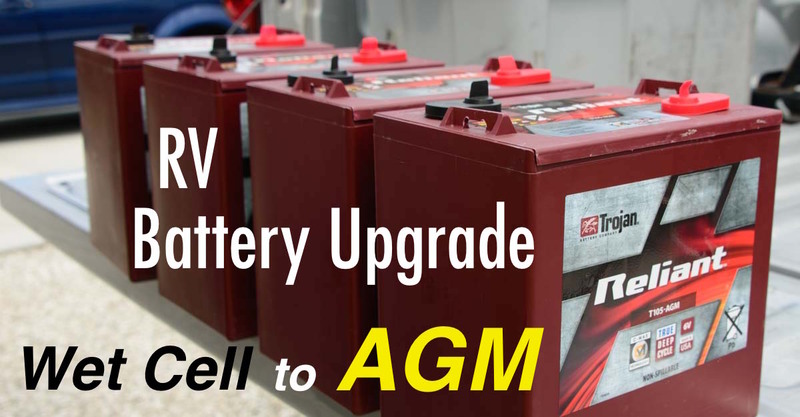 The “overtemp” magic number for the EGT is 1350. 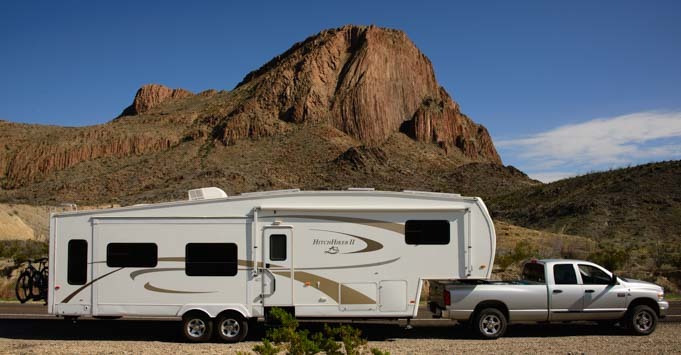 Typical temps we have seen driving around town are in the mid-900’s, and climbing a long 5% grade while towing our fifth wheel, we’ve seen the mid-1100’s. However, these have just been the long, gradual grades of Arizona and not the steep switchbacks typical of Rocky Mountain passes. 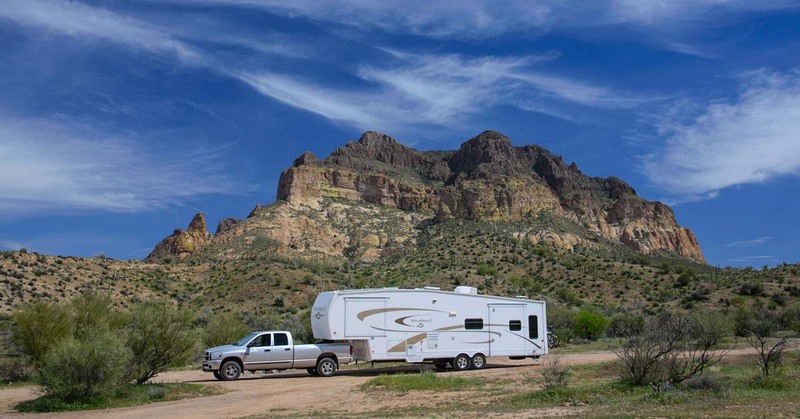 We will report our findings about the exhaust gas temperature readings once we have taken our RV over a big mountain pass! 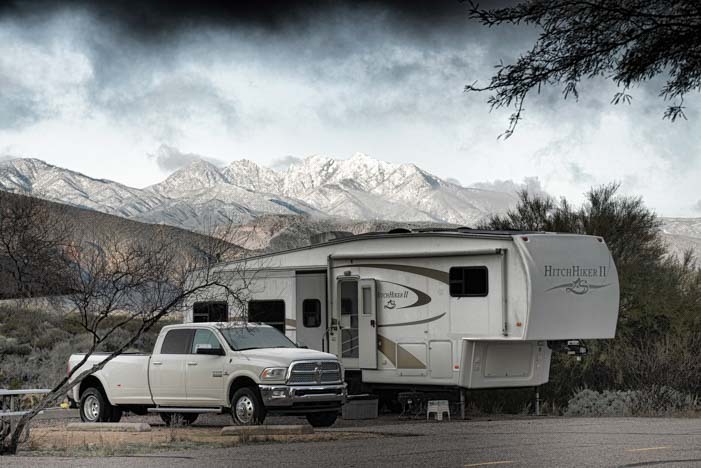 Our only interest in the tuner has been the improved power while towing, improved fuel economy while not towing and the additional temperature data that is made available when towing over big mountain passes. 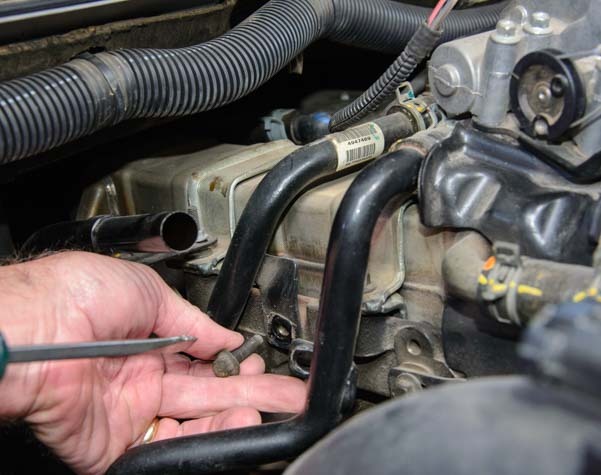 There is a Maintenance Manager mode where you can establish a reminder system for standard maintenance items like changing the transmission fluid, checking the trans case fluid level, inspecting the brake pads, lubing the tie rod ends and rotating the tires. Simply get it started with your current odometer reading, and the reminders will alert you at your chosen intervals. 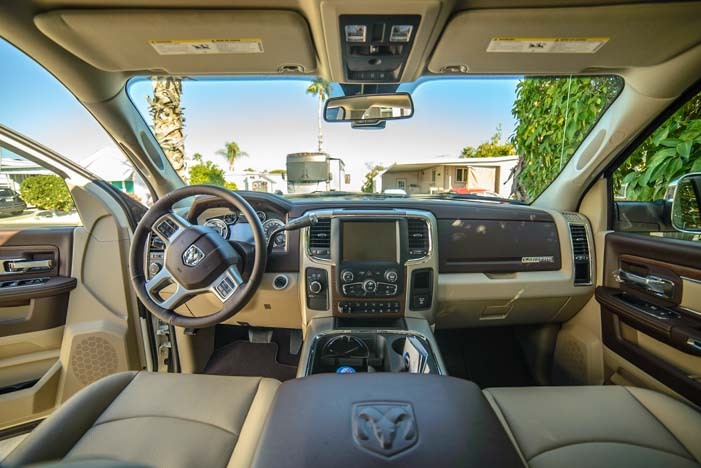 If you are really concerned about fuel economy, there is a Mileage Coach that can show you how to vary your foot’s pressure on the gas pedal to maximize fuel economy as you drive. You can also find out the fuel cost per mile of a particular trip if you enter the price of the fuel you buy! In addition, the Edge tuner can reveal the Diagnostic Trouble Codes that are present when the truck’s Check Engine light goes on. 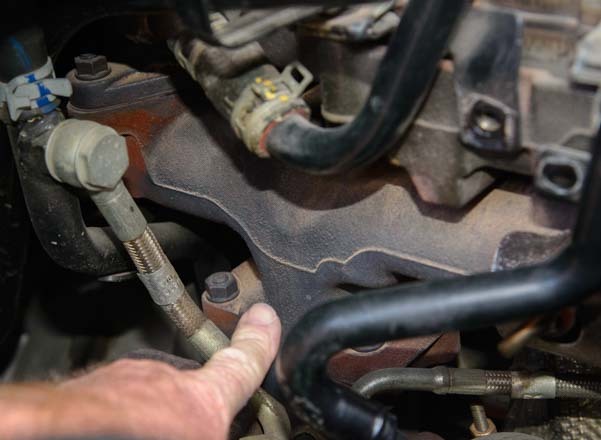 Most codes can be looked up on the internet, so this might save some head scratching before heading off to a mechanic to get the problem looked at. 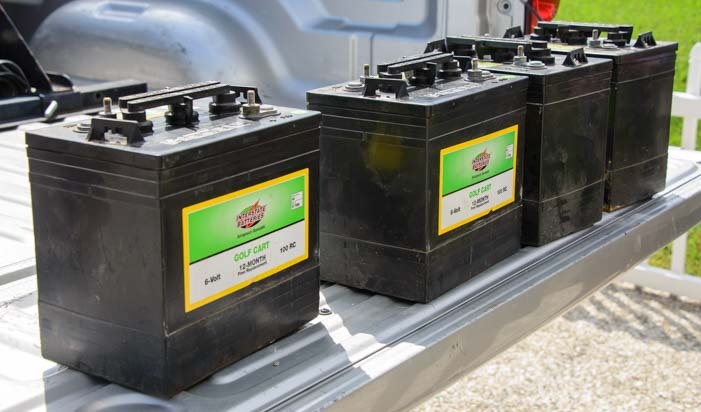 We have used only Levels 1 and 2 (for towing and around town driving), however there are two more levels beyond that for increased power performance, if you find your truck on the starting line of a racecourse. These modes adjust the fuel injection and timing to be more aggressive. In addition, the CTS model can be interfaced to a backup camera and it can also monitor the pitch, roll and G-forces!! For those with racing in mind who find themselves at a drag strip, there are also 0 to 60 mph performance tests and quarter mile tests, and the record highest values of these tests are maintained. You can also connect the Edge tuner to a computer using the USB port. You can retrieve all the data from the Edge programmer into an Excel-readable .csv file. using the downloadable Windows software called MyStyle (instructions given in the manual). For us, however, we are content with just the basics! Edge Product Lineup Explained – Which models do what?! 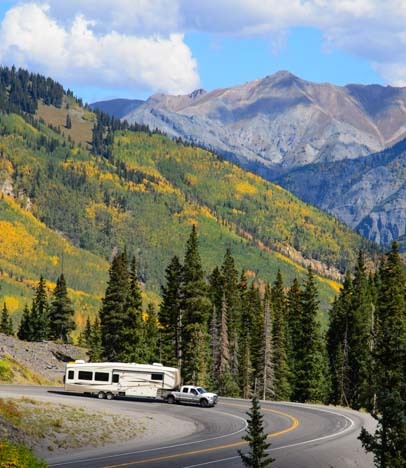 Ouray Corado – A great area to visit with your RV! After 20,000 very happy miles with this engine tuner, we replaced our ’07 Dodge Ram 3500 with a 2016 Ram 3500 dually. 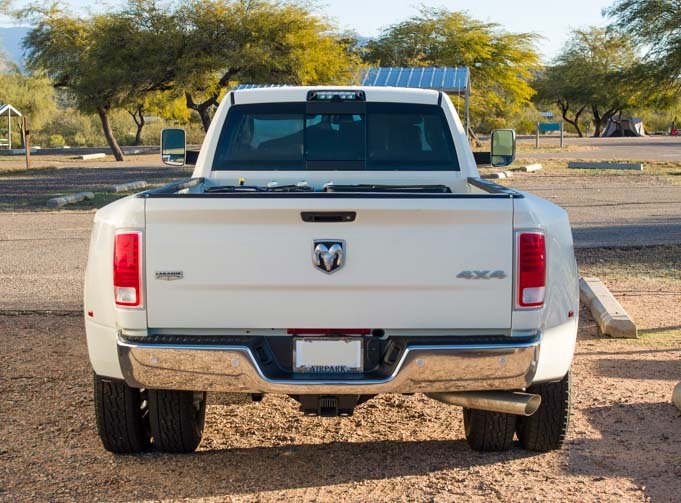 A detailed description of our buying process and options on the new truck can be found here: Which Are the BEST Ram 3500 Options for Towing a 14K lb. 5th Wheel Trailer? A fun story is that rocker Alice Cooper Sold Us Our Truck! 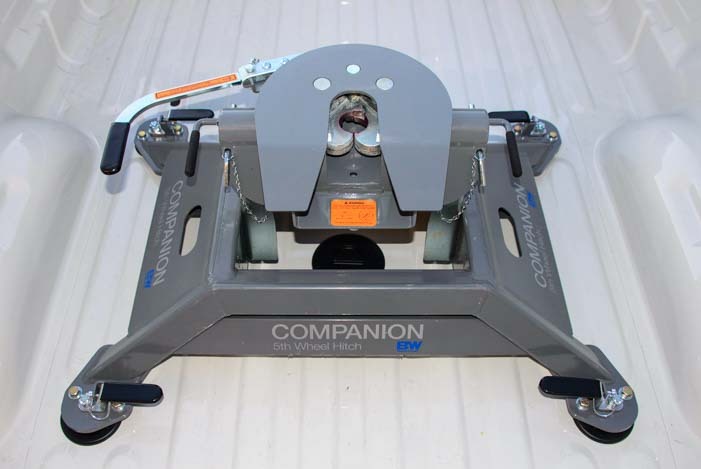 For those that are curious, we put a fabulous “puck” based B&W Fifth Wheel Hitch in the bed of our new truck, and we’re getting another Edge tuner! Enjoying our kayak at St. George State Park, Florida. 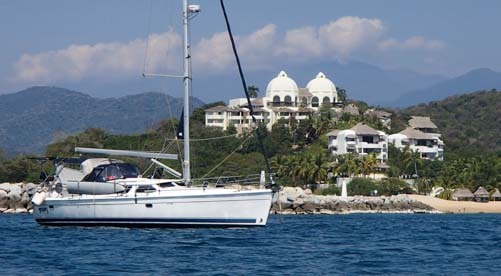 Puerto Balandra, Sea of Cortez, Mexico. Redfish Lake outside Stanley, Idaho. The kayak in its rolling case. Bahía Falsa, Sea of Cortez, Mexico. Tight squeeze going into the fiver basement. Once there it takes up a lot of space. Getting ready to hoist the kayak. the molten plastic inside the mold. Hobie Cat factory, Oceanside, California. New kayaks ready to go. Pedaling into the mountains at Redfish Lake, Idaho. platform with three inflatable chambers: two pontoons and a floor. person in the rear who has a small dial control connected to a rudder. photos and use the binoculars with ease. using clips and webbing straps. cord storage area in the back. folded up and over the top. pull its webbing straps tight. 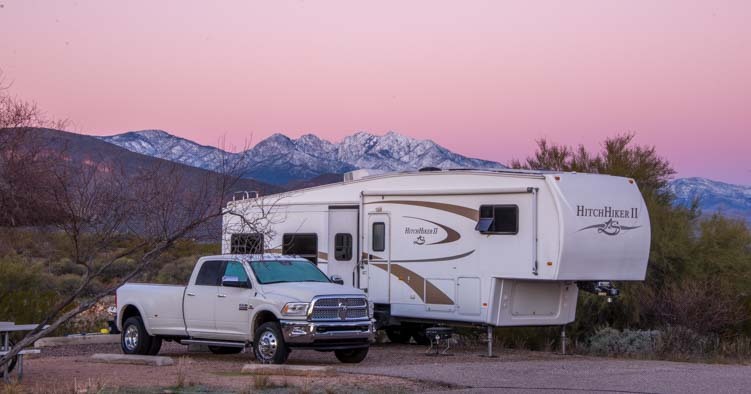 campsite to the trailer, or from a boat ramp to the truck is not a problem. bus would be a challenge. this beast. However, the days on the lakes and rivers are well worth the hassle. anchorages we have stayed in. and less inclined to put your feet to sleep. has cooled the mold is opened up and out pops a new kayak hull. It was a lot of fun to see all the new gleaming kayaks lined up. one season in the tropics, I would recommend taking a long look at a hard shell tandem Hobie rather then the inflatable. New to this site? 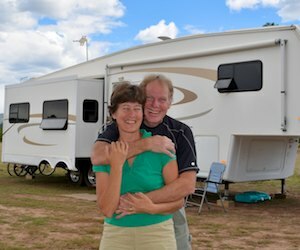 Visit: RVers Start Here or Cruisers Start Here to learn where we keep all the good stuff!